Sorry about the mess, folks. I’m trying to update the menu, and a few things have been shifted around temporarily. 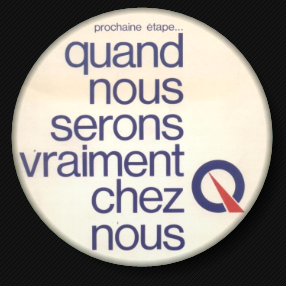 If this is your first time here, the title of this post will only make sense once you read the 1972 manifesto of the Parti Québécois. That PQ document is entitled Quand nous serons vraiment chez nous, and calls for a Communist State of Quebec. See the sidebar. Dorothy (“Dot” for short) Fuhrman of Kelowna, British Columbia, was 83 years old in 2008 when I found her web page, Canadian Military History, tracked her down and called her up. Dorothy had collected news headlines for decades, documenting the transposition of Canada’s federal ordnance and military infrastructure into Quebec. As well, Dorothy noted massive federal funding (from Canadian taxpayers) that went to Quebec-based corporations; while high-technology industries, including air and space technology were hijacked out of their provinces of origin and moved to Quebec. In essence, Quebec deliberately has been built up to be a North American military power. This future sovereign titan would fall directly into the hands of the veiled Communist Parti Québécois (PQ), as a parting gift from the hands of the veiled Communist Liberals1 who set up the PQ so they could “fight” it in a referendum and lose. 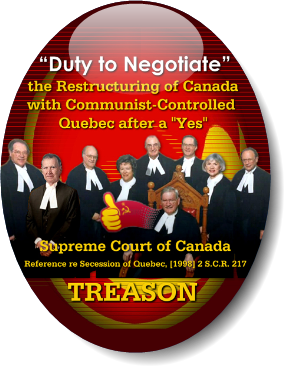 The “loss” would allow the Marxists, Soviet moles and Fabian Socialists running the federal level to “negotiate” with the Marxists, Rhodes Scholars and Fabian Socialists running Quebec to impose the “New European Soviet” system on all of Canada, in the name of “national unity”. I tried to explain to Dot that Quebec was being ramped up for North American Union; that it had to appear to “secede” as a pretext to reconstruct all of North America on the lines of the European system. Dot wasn’t buying it. The decades of propaganda setting up a new War of the Roses between the French and the English in Canada as a front for other subversive activities, had done a thorough job. Dot was convinced that Pierre Elliott Trudeau had been pro-French and anti-English, and had thus robbed “English Canada” for Quebec. In fact, Trudeau was pro-Soviet, anti-freedom, and had robbed Canada to create a North American military power able to restructure the continent for his friends in Moscow. The North American Union logo of the 1995 Quebec referendum to “secede”. «OUI!» et ça devient possible! “Yes!” and it becomes possible! 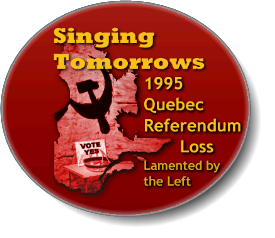 Shortly after the 1995 referendum whose logo was a borderless North America, and whose slogan was “Yes, and it becomes possible“, news leaked out that a communiqué had been faxed to Canadian Armed Forces at home and abroad from the office of the Leader of the Official [federal] opposition, Lucien Bouchard, on October 26th, four days before the 1995 referendum. The fax encouraged Canadian military personnel born in Quebec to defect to a new Quebec Army immediately after a “Yes”. The message even reached Canadian troops stationed in Bosnia. Evidently, the “Yes” was expected in 1995 despite the fact that early opinion polls indicated Quebecers did not want another referendum. Even documentary film footage (I call it “docuganda”, a fusion of documentary technique with propaganda), refers to the Parti Québécois’s “reluctant troops”. The voting public was unwilling to be dragged to the polls yet again in a bid to destroy their country. The seditious fax was discussed in Hansard; attested to by Diane Francis, a former American and Financial Post Editor (appointed 1991), in her newspaper columns and in a book she wrote. Francis received a copy of the fax from National Defense Minister, David Collenette. The fax was quoted and its implications relied upon in 1996 by Harvard Lawyer and Congressman, Tom Campbell — described in some quarters as a “Red Cartelist” — as grounds for USA and Canada to forge supranational institutions (the joint institutions of a North American Union in embryo) to prevent North America from unraveling when Quebec “secedes”. That was absolutely an attempt in 1996 by the Marxist CFR — of which Campbell and most or all of his hand-picked witnesses before the Western Hemisphere Subcommittee of Congress were members — to “deepen” NAFTA on the excuse of Quebec “secession”. The City of Montreal is pleased to welcome university students from Canada, the United States and Mexico to the fourth edition of the Triumvirate, held by the North American Forum on Integration (NAFI). A vehicle for reflection and dialogue, this model parliament — which will take place in the council chamber at Montreal City Hall — is expected to help you better understand the issues surrounding the implementation of NAFTA. The Mayor then went on to speak of the NAFI model parliament as symbolizing “an openness founded on the free exchange of ideas and on freedom of movement, transcending national and cultural borders.” He also, irrationally, praised the exercise of the model parliament as “democracy”. Christopher Story, editor of Anatoly Golitsyn’s (The Perestroika Deception) might better call it “democratism“, the illusion of democracy. The national border shared by Canada and the USA has not yet been officially removed. The impetus in that direction, however, was provided by 9/11, as an excuse to throw a unifying military perimeter around the continent. Therefore, one year after the failed attempt to dismantle North America for “Total NAFTA” by Quebec “secession”, and some five years before 9/11 on the pretext of which NAFTA has, in fact, been “deepened”, although still without core institutions, the CFR gave itself motive, and therefore made itself a “suspect” in the preparations and commission of the phony “terrorist” attacks of 9/11. With respect again to the 1995 seditious fax, a Montreal lawyer attempted to bring criminal sedition charges against Lucien Bouchard and Jean-Marc Jacob, the federal Member from Charlesbourg, named and repeatedly quoted in the fax. The lawyer was slapped with a gag order by a Montreal judge. The lawyer then switched jurisdictions and rushed to Federal Court in Ottawa, where that judge dismissed the case, declaring the fax to be a harmless “job offer”. When the lawyer tried to appeal, he was advised the courthouse taping apparatus had “malfunctioned”; and there was thus no record of his oral pleading. a “Yes” in the 1995 Quebec referendum. In 1985, Mr. Iacobucci was appointed Deputy Minister of Justice and Deputy Attorney General for Canada; in 1988, he was made Chief Justice of the Federal Court of Canada; and in 1991, a Justice of the Supreme Court of Canada. Together with his “brothers and sisters” on the non-judicial advisory bench, Mr. Iacobucci concocted a phony pretext to force Canada to “negotiate” its own dismantling after a Yes in a future Quebec referendum — the very dismantling necessary to complete NAFTA and the North American Union. In the video clip above, he’s in Boston, celebrating the accomplishment. Well, as they say: “See no evil, hear no evil,” and you don’t have to act upon it. 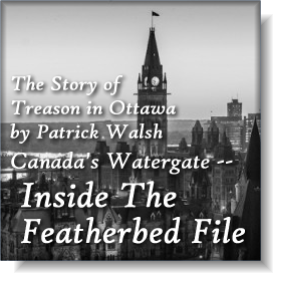 The name of the game is treason, and how to pull it off under the noses of Canadians. « Un Québec souverain aura besoin de tous les militaires québécois actuellement au sein des Forces armées canadiennes, estime M. Jean-Marc Jacob, député de Charlesbourg ». “A sovereign Quebec will have need of all Québécois soldiers currently in the Canadian Armed forces, estimates Mr.Jean-Marc Jacob, Member for Charlesbourg”. « Évidemment, le Québec ne doit pas prétendre, à cause de contraintes financières, se doter d’une armée capable de protéger l’intégrité de son immense territoire. Il est utopique de penser maintenir ou créer une capacité militaire coûteuse (armée, marine, aviation) […]. Le Québec a besoin d’une force de défense, notamment pour surveiller et intervenir sur son territoire, participer à des alliances stratégiques internationales et à certaines missions de paix, en plus de répondre à tout besoin en matière de sécurité civile, comme dans le cas de sinistres naturels, de recherche ou de sauvetage. “Obviously, due to financial constraints, Quebec cannot lay claim to an army able to protect the integrity of its immense territory. It is utopian to imagine maintaining or creating a costly military capability (army, navy, air force) […]. Quebec needs a defense force, in particular to control and intervene on its territory, to participate in international strategic alliances and in certain peace missions, as well as responding to needs for civil security, as in the case of natural disasters, search or rescue. À propos de cette dernière phrase, la version anglaise disait « the day after a Yes win » ; mais, pour noyer le poisson, on a fait croire aux anglophones qui ne connaissaient pas les subtilités de la langue française que cette traduction était erronée et qu’il aurait fallu lire « some time after a Yes win »8. Sans ergoter davantage, mentionnons à cet égard que, si l’expression française « au lendemain de » comporte une ambiguïté, l’adverbe « immédiatement », lui, ne laisse place à aucune équivoque ! In connection with this last sentence, the English-language version said “the day after a Yes win”; but, to hook the fish, anglophones unfamiliar with the subtleties of the French language were led to believe that this translation was a mistake, and that it should have read “some time after a Yes win”. Without further ado, let us mention in that respect, that if the French expression “shortly after” involves an ambiguity, the adverb “immediately”, leaves no room for doubt! Le communiqué est astucieusement formulé, de façon à faire passer le message de Lucien Bouchard et du Bloc Québécois, sans pour autant que cet appel aux armes puisse être directement attribué à Bouchard lui-même. Le communiqué cite Jean-Marc Jacob qui, à son gré, a pu prendre ses distances des citations ou pinailler sur des détails insignifiants. The communiqué is astutely formulated to transmit the message of Lucien Bouchard and the Bloc Québécois, without, however, attributing this call-to-arms to Bouchard, himself. The communiqué quotes Jean-Marc Jacob who can distance himself as he likes from the quotations, or focus on insignificant details. The extracts of the seditious fax quoted by the CFR’s Harvard lawyer, Tom Campbell are far more explicit and direct than those referred to by Diane Francis. Why did Francis — who considers herself a member of “the Establishment” (having been invited aboard The Royal Britannia, for example), not take the bull by the horns as Campbell did, and quote the “command” to “transfer” allegiance? If, indeed, the fax was such a “command” to French-Canadian members of the Canadian armed forces to “transfer” their “loyalty” to a new “country” of Quebec, it was clearly not a mere “job offer“. The Ottawa judge and the Montreal “gag” order apparently concealed a direct, federally-appproved defection from the Canadian Armed Forces in order to man the ordnance which the federal level systematically has transferred into Quebec for decades — as we shall presently see — to give the new future State an instant, and expensively equipped Armed Forces. The communiqué alleging “budget constraints” for Quebec in setting up an independent military, must have been tongue-in-cheek. The included criticism that “Canada buys too much”, and “too expensively,” may in fact mean that “the extravagances of Canada,” in over-spending of its military budget, have been tailored to supply Quebec with a well equipped Armed Forces — at the expense of all Canadian taxpayers. Encore plus scandaleux fut le fait que, selon des sources militaires anonymes, des haut gradés interdirent le déplacement d’équipement ou de personnel militaires à l’extérieur du Québec, ce qui est hautement suspect et inquiétant. L’ancien ministre de la Défense de Brian Mulroney, le séparatiste Marcel Masse, avait fait transférer en 1992 des armements provenant de dépôts militaires à Moncton, Ottawa et Toronto vers d’énormes installations de cent millions de dollars dans l’Est de Montréal. La presse exprima quelque inquiétude à l’époque, mais les plans furent quand même mis à exécution et résultèrent en une quantité disproportionnée de matériel militaire au Québec. Even more scandalous was the fact that, according to anonymous military sources, top-ranking brass had forbidden the removal from Quebec of military equipment or personnel, which is highly suspect and disturbing. Former National Defence Minister under Brian Mulroney, the separatist Marcel Masse, in 1992 transferred armaments from military depots in Moncton, Ottawa and Toronto to enormous hundred-million-dollar installations in the East of Montreal. The press expressed some anxiety at the time, but the (transfer) plans were nonetheless put into operation, resulting in a disproportionate quantity of military equipment in Quebec. À toute fin pratique, les médias ignorèrent cette affaire de sédition. Quelqu’un complotait-il un coup d’État ? Pour quelle autre raison Lucien Bouchard inciterait-il les soldats à faire défection ? Y avait-il une structure de commande séparatiste déjà en place pour diriger les déserteurs ? Y avait-il un plan d’action concernant les armements ? Avait-on sollicité et obtenu des serments d’allégeance au Québec ? Combien de séparatistes avaient infiltré nos forces armées ? Le haut commandement était-il au courant de telles possibilités ? Pourquoi Ottawa ne demandait-il pas une enquête et ne portait-il pas d’accusations ? For all practical purposes, the media ignored this business of sedition. [The pre-referendum fax] Had someone planned a coup d’Etat? For what reason had Lucien Bouchard incited the soldiers to defect? Was a separatist command structure already in place to manage the deserters? Was there an action plan concerning armaments? Had oaths of allegiance to Quebec been solicited and obtained? How many separatists had infiltrated our Armed Forces? Was the top command aware of such possibilities? Why did Ottawa not order an investigation and bring charges? Armaments from federal military depots in Moncton, Ottawa and Toronto, were transferred to Montreal in 1992! That was the year that Rhodes Scholar and “Liberal” Premier of Quebec, Robert Bourassa, had scheduled a referendum on “Sovereignty”2. But, that’s not all. Federal military transfers into Quebec far exceed those reported by Diane Francis in her book, Maîtres Chanteurs Chez Nous. Dot Fuhrman’s research indicates that military transfers began in 1978, two years before the first referendum to “secede” in 1980. “operational bases in Toronto and Moncton were closed, and a $100 million-dollar military supply depot was built in the depressed east end of Montreal. (Tanks, armoured personnel carriers, howitzers, heavy-guns, trucks and all spare parts and supplies for Canada’s army are stored there, having been transferred from from bases like Renous, New Brunswick; Dartmouth, Nova Scotia; Wainwright, Alberta; and Nanaimo, British Columbia.). The other provinces are left with training facilities only“. Introduction: This is a report I have worked on for some time from material I had collected over the years. I hope you will find it interesting. To understand why Quebec is now Canada’s Military force, we must start from the year 1945. 620,000 enlisted; 66,000 gave their lives; 172,950 were wounded. Canada gave industrial help, munitions, motor vehicles, aircraft, and ships to the 5-year war. At the end of World War II, Canada, with a population of only 11 million, had the world’s 3rd largest navy, 4th largest air force, and an army of 6 divisions. Canada’s armed forces, consisting then of an army, a navy and an air-force, fought bravely and we gained the respect of the world. We were no longer a colony of Great Britain, we became one of the world’s most respected military nations. But, it didn’t take long to see our military reduced to less than one-third its original size. This came about because of the unrest in Quebec. During the Quebec Referendum of 1995, Quebec came close to separating from Canada and it was then they realized how ill-prepared militarily they were to protect themselves in case of war. Instead of building their own army, they found it more convenient to take ours, one piece at a time, with the blessings of Trudeau and Mulroney. Anything to appease Quebec, so they would not leave Canada. The Official Bilingualism Act gave Trudeau special powers, and inch by inch, changes were made for French Quebec to gain control of Canada’s army. Days before the Referendum, P.Q. National defence leader, Jean-Marc Jacob, faxed a press release to all Quebec military bases urging Quebec-born soldiers to join a new Quebec army if they won the Referendum. How quickly Canada changed. How and why our military was confiscated by Quebec. In talking to some veterans at our Legion here in Kelowna, I learned that the transfer to Quebec of all materials such as ammunition, trucks, tanks, clothing and uniforms, guns, rifles, etc., began as early as 1978. Materials required for training men were the only things left for the other Provinces to control. It is obvious why New Brunswick, the only bilingual province, was trusted to have the Gun Registration headquarters. Prime Minister Brian Mulroney’s Defence Minister, Marcel Masse3, takes the most credit for the military transfer to Quebec. His dislike for the Anglos was obvious when he immediately ordered all military bases to speak French to him first, conduct all business in French first, and to be a bilingual army by the year 2002. Marcel Masse is currently [YEAR?] Quebec’s foreign ambassador to France, a timely position. Manitoba was Canada’s aviation center from the beginning of time, but Chrétien and Mulroney planned to move all of Manitoba’s aviational and intellectual industry to Quebec. And so, the big transfers began. The most blatant transfer of power was Manitoba’s CF-18 fighter jet aircraft, the Hornets. The Canadair maintenance plant was hijacked to Bagotville, Montreal. Winnipeg’s bid was lower than Quebec’s. It was moved in 1986 [along with?] a $312-million interest-free loan. Not all engineers were transferred, some were imported from France. Trudeau’s Mirabel Airport outside of Montreal, Quebec, had a military purpose. We called it a white elephant then. “The agency might be the best way to keep the country together,” said Lucien Bouchard. A good number of English scientists [quit?] when they were denied their request to accompany the move to Montreal. Instantly, our space center became French, answering the phones in French first. Mulroney’s government planned to make Montreal Canada’s aerospace center alongside the aviation center. In 1992, the Space Agency had 268 employees, 2/3 of whom were Francophones, in a world where English is the space language, but here Anglos are in technical ghettos. A space training school patterned after the Americans [?]. The big naval move to the Province of Quebec was to preserve Quebec’s strong naval heritage to honour the great French navigator and sea fighter Pierre D’Iberville, who tried unsuccessfully to drive the British out of the Hudson Bay Trading posts. This was one big lame excuse for the moves. The purchase of secondhand subs from Great Britain was a huge mistake. After training, the sailors didn’t know the hatch had to be closed in rough seas, and there was loss of life. The navy has had difficulty finding crews for the 12 frigates, four destroyers, and two replenished ships. Quebec has all its forces in one close area in their province, while those of the rest of Canada are scattered across 4,000 miles. Guess who can mobilize first? British Columbia is helpless; it has to look to Edmonton for any disaster aid. In Year 2005: retiring Lt. Gen. Mike Jeffery said “recent budget increases is not enough, our army is too small and stretched to the limit and adding new missions could be disastrous after 10 years of cuts”. He told our new army boss, Lt. Gen. Rick Hillier. Hillier wants more soldiers and fewer tasks. Our Canadian army is struggling with lack of modern equipment, and a shortage of trained soldiers to send into combat. When our men first went into Afghanistan in the summer, they had dark green uniforms which they tried to disguise with paint. They lacked modern equipment, and even food. They had to rely on the American army for help in all areas including the use of the American hospital in Germany for our wounded men. In Afghanistan, Canadian troops had access to U.S. airlift capability, Hercules and C-17 Heavy-lift aircraft, Chinook and Blackhawk troop transport, and they used their vehicles, the Humvee, while under the command of Major General Lewis MacKenzie. MacKenzie said “we can’t get to the war or home without the help of our allies”. The only thing we had that the Americans could use was our Coyote armoured vehicles. Since MacKenzie didn’t speak French, he was sidelined. We are minus one fine, brave General, but language takes precedence over all else. Our military is helpless, with no heavy transport. So, since we are not helping the Americans in Iraq, we have had to call on the Russians to transport our heavy equipment to two disasters in 2005. Bilingualism in the military is one good reason why recruits are harder to enlist and we are now turning our efforts to recruiting females. They are less interested in advancement and can fill spaces where they are so badly needed in our shrinking disastrous army. Bombardier, the World Industrial power Chief. Over 50 years ago, in the 1950’s, Bombardier invented its first snowmobile, I know because I was in Quebec at the time. I watched Bombardier grow to become a world military power in the manufacturing of jets, regional aircraft, rail and subway transportation in New York and Britain; and in the manufacturing of equipment and motorized recreational products with factories in the Americas, Asia Pacific, and other parts of the world. Bombarier’s revenue for fiscal year 2004 at Jan. 31 was $23.7 billion dollars Canadian. In 1998, Bombardier was awarded a $2.65 billion contract — the largest with no competition. The company had contributed some $254,000 to the Liberal party since 1995. On 23 November 2005, the Federal Government ordered 15 new transport planes at a cost of $5 billion dollars from Bombardier. I must stop here because a huge book could be written about an empire that succeeded with the help of our government, who poured billions in loans, grants, contracts, and even guarantees in the billions, into Bombardier customers. Enough! This report comes from material I’ve collected over the years and my own personal conclusions about the conditions of our army then, and now, in the year 2006. If Quebec should separate and a disaster occurred such as an internal disturbance, floods, earthquakes, fires, etc., we would be like the U.S.A. army having all its arsenals in Confederate Territory in 1861. That is not the end of developments in Quebec. UNITED NATIONS THREAT … Something quite frightening is in process here, 30 miles south east of Montreal (Que. ), 35 to 40 miles north of New York State, in St. John (Que.) The very official Military College which has existed for decades to give French Canadians in Canada a University training to become army officers — like West Point in the United States — is being forced to shut down by the Canadian government under economic cuts, the Prime Minister of Canada said about three weeks ago. This morning, March the 9th, on CBC National Radio Broadcast, sources from the government announced clearly that the College would still keep its first goals, but now under United Nations’ Command while the military personnel from this college will be moved to Kingston (Ontario) — North of Ft. Drum (N.Y.) — and the civilians from the same College would, for the most part, be laid off. The news, released at 7:30 A.M. (Eastern time) on this matter, unveiled the fact that the United Nations has been looking for years in different countries for a sure place to establish an official Military Officers University for the future formation [training] of the United Nations’ Officers of the Multi-National armed forces. LARGE TROOP TRANSPORTS … In the last three weeks, [March 9th, 1994] large military helicopter troop transports regularly cross the Canada-US borders into Canada from Maine, Vermont and New York State towards secret destinations. Strange — because Quebec is just a few months before its next Provincial election and Referendum concerning the Independence of Quebec, its separation from the rest of Canada. Looks like sort of a ‘Coup’ is in preparation, which might end up, according to some confidential sources, into the beginning of a state of civil war in eastern Canada. CONCENTRATION CAMP BOOK…It will be only a week before receiving the first copies from the printshop. So, everyone who ordered it will have their own copy before the end of March. It will be my pleasure to personally autograph a copy to the Director of the APFN Network. STRANGE SILENCE…Since about two weeks I did not receive my fax or communication from anybody in the states. My Fax is always open for my American compatriots. Truly yours, and God Bless you all. The main reason why it took so long, from November 1993 until now, to finally have this first book on The United Nations Concentrations Camps in America published deals with security problems. This is why, also, I couldn’t tell anyone this book is to be, in fact, a series of four separate publications covering all the United Nations Conspiracy in America. For example, on Feb 11, 1994, a man pretending to be an undercover RCMP — Federal Canadian Police said to me that they will have to do something else to stop me in my work to expose the underworld of the “World Government” because all previous economic pressures and threats seemed not to have discouraged me so far. I wanted to make sure to deliver as much information as possible to everybody before something might happen. I didn’t have any other choice than not telling anyone, before the first book of the series would be printed, what the main project of this exposure would be. I’m sure everybody will understand this. Right now, actually, since I have in hand all the information to fully complete the series planned, I must hide myself somewhere in Canada in order to avoid any seizure of documents, any arrest or even any attempt against my life. I even had to cancel, for an indefinite period of time, all public appearances, so my financial budget is getting low and hard to live with. THE UNITED NATIONS CONCENTRATION CAMPS PROGRAM IN AMERICA, a series of four books that will be published one after another in 1994, each book to be between 125-150 pages with “Official Documents’ and “Maps” reprinted. — Is anybody aware of the fact that in Jan. 9;4 the very Official Quebec League of Rights and Liberties has publicly accused me of racism only because I was using some extracts from the newspaper The Spotlight, and even published something about that? COUP D’ETAT AND WAR PREPARATIONS IN AMERICA, Book I; $12. U.S. BIRTH OF A POLICE STATE IN AMERICA, Book II; $12. U.S. THE CONCENTRATION CAMPS’ PROGRAM, Book III; $12. U.S. THE UNITED NATIONS MEDICAL CONSPIRACY AND SLAVE LABOR IN AMERICA, Book IV; $12. U.S.
(All prices are Postage and Handling included). Donations are more welcome to help. The above article appeared in Contact: The Phoenix Project (15 March 1994, p. 22 of 32). Serge Monast’s two forthcoming books on these subjects Concentration Camp Program in North America (now published, over 100 pages, with Maps), and his Vaccine, Military Experimental Medicine and Liquid Crystals (to be published shortly, also over 100 pages), each $16 American, can be ordered from Mr. Monast at Box 359, Mansonville, Quebec J0E 1X0, phone and fax 514-244-6288, 24 hours daily. Some nine years ago a French-Canadian reporter named Serge Monast called the ministry, desperate to speak with me personally. Mr. Monast stated he had come into possession of documents which proved the existence of a secret plan for a concentration camp system throughout North America. He sent them to me and, after a parallel investigation of my own, I became convinced the documents were authentic. Serge Monast was telling the truth. The horrible, horrible truth. I never received that information. Serge Monast died before he could get it to me. I made a promise back then that I would get to the bottom of this matter and report the truth to you, the dear readers of Power of Prophecy newsletter, who truly care for humanity and are concerned about the rapid growth of the Police State. Now, after years of intensive research and investigation, I have just released my latest video, Gulag USA——Concentration Camps in America (Available in VHS or DVD). In this jaw-dropping new video, I present a mountain of new evidence and facts with many photographic materials. I encourage you to obtain a copy of this revealing and documented video. Judge the facts for yourself–and then act accordingly. 1 See “The Secret Committee of Power” in Jean-François Lisée’s In The Eye of the Eagle (Boréal, 1991). Robert Bourassa at the Quebec Summit, with Brian Mulroney, negotiating the annexation of Canada under NAFTA with Ronald Reagan. In 1991, Liberal Premier and Rhodes Scholar, Robert Bourassa, caused the Quebec Legislature to pass Bill 150 into “law”, calling for a Quebec referendum on “sovereignty” by no later than 1992. Bourassa was an economist and a big fan of the European Union. In 1976, while his good friend, Communist René Lévesque ran Quebec for the Parti Québécois, Bourassa went to live and teach in the EU in order to study that system. Which, of course, was also the system René Lévesque wanted for Canada, and the system Trudeau proposed to Lévesque the night before the 1980 referendum. As there is no power in the Constitution of Canada for a province to secede, and as the Lawful Constitution of 1867 was moreover designed to deny any power to annex Canada to the USA or to dismantle Canada by secession, Bourassa’s 1991 “law” was void. 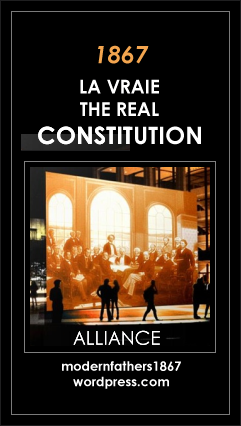 It would be void, even had he “passed” it under the Lawful Constitution of 1867. By this, I mean that Trudeau’s “patriation” of 1982 is void. For more on that, read my introduction to Barry Lee Strayer’s “Patriation and Legitimacy of the Canadian Constitution“. Marcel Masse, Nat. Def. Minister under Brian Mulroney, transferred vast amounts of federal military ordnance into Quebec in 1992. Marcel Masse was a Rhodes Scholar, also identified as a “radical”, a Canadian euphemism for Communist. Masse is said to have “flirted” with “separatism” while a part of the RIN. But, the RIN (Rassemblement pour l’indépendance nationale) was a sinister, far-left Communist organization which disbanded in 1968 to allow the new Parti Québécois to quietly absorb its members. It had begun in 1960 as a “citizens’ movement” which in March of 1963 became a political party. “The Honourable” Marcel Masse was Clerk of the Privy Council and Secretary to the Cabinet (June 5, 1979 to March 10, 1980). He was appointed a Member of the Queen’s Privy Council on November 4, 1993 by Prime Minister Jean Chrétien. Following his term as Clerk of the Privy Council, Masse served as President of the Canadian International Development Agency, Under-Secretary of State for External Affairs, Canadian Executive Director of the International Monetary Fund and Secretary to the Cabinet for Federal-Provincial Relations. After his election to the House of Commons in 1993 as part of the Government of Prime Minister Chrétien, Masse also became Minister of Intergovernmental Affairs, President of the Treasury Board, Minister responsible for Infrastructure and Minister responsible for Public Service Renewal. Masse worked for the World Bank prior to his death on August 25, 2014. L-R: Lester Pearson and Paul Hellyer, 1965, initiated the unification of Canada’s Armed Forces. This early period is interesting, because everything aimed at North American Union starts to happen at once. ● In 1960, a slew of Communist groups emerge as Quebec “separatists”; ● the Liberal government of Jean Lesage makes a first attempt to construct a Communist Plan to run Quebec; ● in late 1962, law professor Trudeau’s student, Bernard Landry (future Premier and sponsor of the model parliament for North America after 9/11) leads a student riot against English Canada that may have been designed by Trudeau, himself. Known as the “Gordon Incident,” it is literally pre-figured in Trudeau’s “New Treason of the Clerics,” a few months earlier. ● That creates the environment for the Castro-trained Communist FLQ terrorists in 1963 to commence their murder, kidnapping, and bombing spree, mis-portrayed by mainstream press and media as an ethnic revolt by “ultra-nationalist French Canadians” against Canada; (by 1968, the Edmund Burke Society in Scarborough will ask, “Why haven’t they told you the FLQ is Communist?”); ● in 1963, Soviet agent Pearson launches a royal commission as a pretext to (unlawully) convert Confederation to multiculturalism (which Trudeau demands as well, in his 1962 April issue of his pro-Soviet magazine, Cité Libre. Trudeau calls it “polyethnic pluralism”; ● in 1964, René Lévesque twice urges high-school children (close to voting age) to take up “guns and dynamite” if Canada won’t give Quebec its new “associate state” system; ● on 10 October 1964, Queen Elizabeth II visits the Quebec City Legislature and calls Confederation an “outdated protocol”. She demands a new constitution in the form of an “agreement“, and implies a referendum will ensue; ● on 10 November 1964, the Queen’s Communist Minister, René Lévesque, in office as one of Lesage’s “Liberals”, appears on French tv in his official capacity as a Minister, calling for the complete “restructuring” of Canada to suit the “needs” of Quebec, portrayed as ethnic needs: cultural and linguistic. (However, 8 years later, in 1972, a French-only manifesto of Lévesque’s Parti Québécois says Quebec needs full sovereignty to construct a Communist plan. ); ● In 1965, the constitutionally guaranteed French-Canadian Catholic public school system is eliminated by a team of Rhodes Scholars, paving the way for non-Catholic mass-immigration; ● in the autumn of 1965, The Marxist Quarterly publishes new constitutions for Quebec and Canada;● in the summer of 1967, on Canada’s centenary, French President Charles de Gaulle hurls the slogan of the Communist “separatists” from the balcony at Montreal City Hall: “Vive le Quebec libre!” (Long live free Quebec!). “Former” Marxist-Leninist leader, Jean-François Lisée, in his book, “Dans L’Oeil de l’Aigle” will ask, had Charles De Gaulle “targeted Canada to strike the USA?”; ● in 1963-68, from Pearson to Trudeau, Paul Hellyer supervenes the unprecedented merger into one new entity of Canada’s three Armed Forces. ● By at least 1978, Canada’s “Red” federal level is transferring federal ordnance into Quebec, with a Quebec referendum on the new system for Canada on the way in 1980; ● in 1982, the lawful Constitution is replaced by a socialist constitution subordinating Canada to the U.N. as future world government. 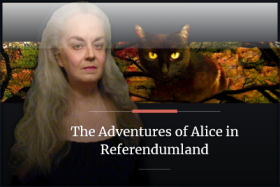 ● The escalation continues for decades: mass immigration is employed to change the population to fit the upcoming new form of multicultural government; ● referendums are interspersed with phony attempts to “amend” the 1982 “coup” constitution to give Quebec an implied “power” to “secede” (facilitating international state recognition); ● referendums, even rigged ones, fail; ● the 1995 referendum fails, a hard blow to the globalists. 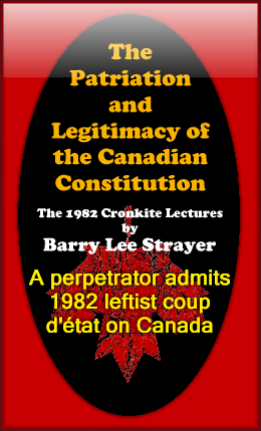 The CFR sends a committee to Congress in September 1996 to plead for common institutions for Canada and America — precisely the institutions wanted by Communist Quebec with the rest of Canada, and which slipped from its reach with the failure of the 1995 referendum; ● the new Supreme Court of Canada (post-1982) concocts a pretext in 1998 to judicially enforce the dismantling of Canada after one more referendum; ● North America is “attacked” to unify the continent under a military perimeter, pending the dismantling by “secession”; ● in America, leftists spearhead a “nullification” movement whose corollary is the mass secession of the States. In his 1995 book, The Perestroika Deception, KGB defector, Anatoliy Golitsyn, put forward a theory of Communist world conquest. The USSR, said Golitsyn, did not “collapse”, it went underground. At the surface, the “new” Russia cosmetically adopted forms and appearances contrived to encourage Western “co-operation” and “convergence”. This would allow Soviet deep penetration of Western civilization. Arguably, neo-Soviet/North American “convergence” has proceeded to such an extent that today, under Northcom, after 9/11, the U.S. Armed Forces are dangerously intertwined with the de facto Armed Forces of a nascent Communist-controlled State of Quebec.